A twisty middle grade adventure standalone for fans of Nevermoor: The Trials of Morrigan Crowabout a cursed boy who embarks on a journey into a magical city of ghosts to find out who he really is. Oscar Grimstone is a normal kid--aside from his secret Curse. Whenever he touches something living, like a flower or his classroom goldfish, they always seem to die. But then Oscar discovers an even bigger secret: even though he is very much alive, he has the ability to transform into a ghost. 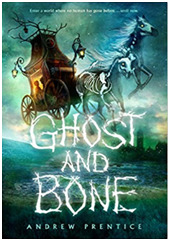 Just when he thinks things can't get any stranger two ghosts show up at his home in a skeleton carriage and he winds up joining them on a journey beyond the real world to a place he never knew existed--the city of ghosts. There Oscar will discover a place where people go once they die, before they aboard a ship to the The Other Side. But will he find out who he really is? Andrew Prentice is the author of two critically acclaimed YA historical novels: Black Arts and Devil's Blood (David Fickling Books). the Carnegie Medal. He has also written for comics, and animation.